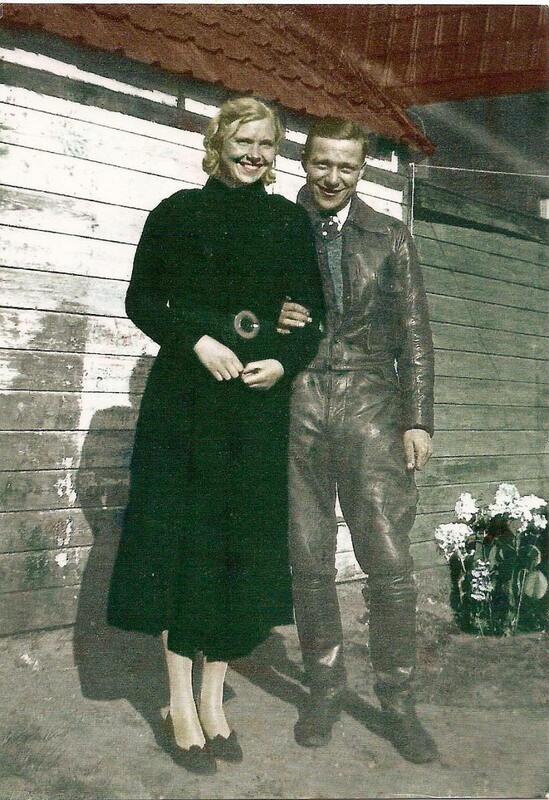 After our wedding at city hall in Purmerend (The Netherlands), on May 22nd 1941, Ab and I moved into an apartment in the old part of Amsterdam Oost. We ended up in Wijttenbachstraat, a rather wide street with tramrails in the center that ended at the train station Muiderpoort. Tram lines 3 and 11 stopped in front of our door. It was a city apartment, typical of the end of the nineteenth century, with four levels of dwellings above each other and in the basement a bicycle storage and an attic floor at the top. The landings were tiny and the staircases steep. We lived on the second floor. Everything was tiny. It was worn out, cramped, but also very cozy. Many of the apartment dwellers surrounding me were, just like me, not originally from Amsterdam but imported from the provinces. The apartment was close to the corner and we had a nice view of the tram stop and the Dapperstraat overlooking the outdoor market that was there every day. My first son Gerald was born here. After the German armies’ invasion in 1940, life went on seemingly as usual in occupied Amsterdam, until in 1941 things started changing. There were raids (razzias) and the atmosphere in the city became grim. The persecution of the Jews started and at the same time all young men to age thirty were drafted to appear for “Arbeitseinsatz.” This meant that Dutch men were forced to work in German industry. At first there was the opportunity to volunteer but as this wasn’t effective, force was used. At some point Ab also was summoned by the occupier’s government to show up at the train station in Amersfoort. No mention was made where he would be taken but it was made clear that not showing up would have unpleasant results. “What should I do, if I don’t go they’ll come and get me” Ab said. He decided to go to the station and traveled to Amersfoort. When he arrived there he was overcome by the strong thought that he was making a mistake, something was telling him not to go through with it and he took the first train back to Amsterdam. He arrived back home late at night and was very worried about what he had done. As a precaution we tied several sheets together and hung them out the window in the back of the apartment in order to flee if necessary. Fortunately nothing happened that night and the next day he immediately left Amsterdam. Via a friend’s in-laws he was able to find a hiding place in the village Watergang in Noord-Holland. He spent some time there until we felt that the attention for him was waning. Oddly enough nobody of the then acting government ever contacted us to enquire where Ab was and why he hadn’t shown up. Meanwhile a curfew became active. After eight o’clock nobody could be outdoors any longer. Toward the end of 1942, the first razzia took place in our street. On a Sunday morning first the bells of all three apartments were rung long and hard and the same time, accompanied by loud knocking on the doors. Next there was a lot of stomping and screaming in the stair well. “Sofort aufmachen” Open the door immediately! “Gibt es hier Juden?” Are there Jews here? As they entered the apartment the soldiers raced through the small rooms, opening closet doors along the way. I was stiff with fright. A soldier points his gun at me and asks “Sind Sie Juedisch?” Are you Jewish? He glared at me intensely. “Nein” No, I was shakily able to answer. “Ausweis zeigen Bitte!” Identification please. And, as quickly as they had come in they left—to the next door and stair well, leaving us all in shock and fear. Meanwhile we saw tram after tram come through filled with the Jews they’d taken away. 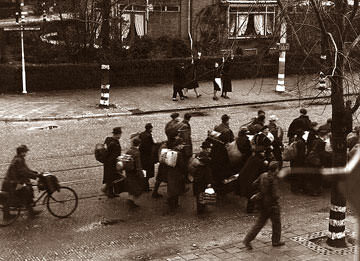 In our street the Jews who had been in the trams were lined up and marched off to the train station Muiderpoort. Loudspeakers announced that it was forbidden to look through, or be close to the windows. Soldiers had their rifles pointed at the windows and whoever looked anyway, was shot at. Ab as well as I did look through the sheer curtains down below. What we saw shocked us deeply! Rows and rows of waiting people, elderly people, young people, children with dolls in their arms. They all disappeared in the direction of the train station never to return. Most of them never returned. We did not know the details of what would happen to them, horrific stories were being told and we were well aware that nothing good would happen to them. At the end of 1943 everything was rationed and life in Amsterdam became very difficult; gas and electricity were rationed too and it was very complicated to get a hold of any food. Ab still could hardly show himself outside as he still faced the threat of a one-way ticket to Germany. We decided to leave the city temporarily and live with Ab’s parents in the Beemster, close to Purmerend. It was a little easier to get food there and there were also more opportunities to hide out if needed. My in-laws had a shop selling bicycles and motor bikes and in the back of the shop was a reasonably sized space where they worked on repairs. Ab had meanwhile joined the “Resistance group Waterland” and it was easier to undertake actions in the less populated polder area. When we left we took the necessary clothes and some furniture but we would keep the flat in Amsterdam. Below us, on the first floor lived Buurvrouw Bieshaar, a typically jovial Amsterdam native whom I liked very much. I made arrangements with her to come every week with the rent money which she would pay for me in exchange for some food I’d bring her. A former collegue of Ab had a bakfiets—a transport bicycle which had a big crate in the front that we could load up with household goods. As Ab was keeping a low profile outdoors, I decided to ride the filled bakfiets to Purmerend. First I’d taken my child to Purmerend by tram, and then I returned to get the bakfiets with our things. It was filled to the rim and half way there things moved and a large painting fell in the street ruining the frame. Right afterwards I saw that there was a leak in the tire. Well, there I was—on my own with all my belongings along the side of the road. I was so weary and worried, and have no recollection of how I got to Purmerend with everything. The year 1944 had started, a terrible year it was. Was this occupation never going to end? We still lived with Ab’s parents where we did our best to survive. Aside from us living with them there were sometimes two or three people in hiding. 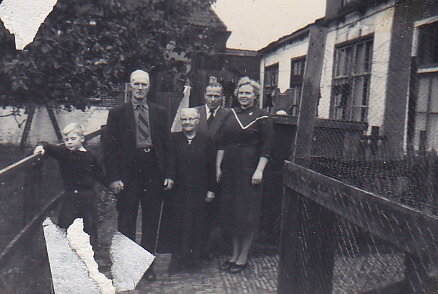 Different people for different reasons but mostly relatives from the province Drenthe that needed a place to hide. Two of them I remember well, Andries and Sinus, they had both fled the authorities in Drenthe. They were a little younger than us. My father-in-law had put together a stationary bicycle that someone would ride in order to create electricity. My mother-in-law had a large old fashioned wooden washing machine and it needed electricity to run. I still see happy go lucky Andries, riding the stationary bike while reading a book, keeping the washing machine going. My mother in law had made up beds for them in the storage area behind the repair shop. To be able to get away in case of peril, they had created a type of alarm system. In the surrounding area of Ab’s parental home there were many orchards and nurseries that would enable someone to find a hiding place. The bicycle shop was in a house, and it too contained a hiding place. On the ground floor the front consisted of the shop and in the back was the living room and the kitchen. The shop and the living room were separated by sliding glass doors with sand blasted French lilies and images of corn. The sliding doors were approximately 2.10 m high, while the shop and living room were about 3 m high. In the living room on both sides of the sliding doors were built in cupboards. When the sliding doors were opened the doors ran along a rail. There was approximately 70 cm space between the floor of the first floor and the top of the closets. Upstairs a lid was made in the floor and when danger lurked the rug was lifted and the fugitive disappeared in the space. It was used many times, Ab as well as his brother and cousin spent time waiting for the all clear sign. Public life had come to a complete stand still. There were no longer trains to other parts of the country, parts of the upper lines and complete sections of rails were taken to Germany. The trams of Amsterdam also disappeared across the eastern border. Halfway through 1944 even the tram between Purmerend and Amsterdam quit. This also meant that there was no food transport whatsoever. Electricity only sometimes, and then only during the day and during certain times. There was no gas at all because the gas factories* couldn’t run due to lack on coal transport. During the second half of 1944, the entire provinces of Noord-Holland, Zuid-Holland and Utrecht were completely isolated by the occupier from the rest of the country (Fortress Holland), ending all food transport to the most densely populated part of the country. Especially in the three cities Amsterdam, Rotterdam and Utrecht the situation was extremely critical. On top of that the winter ‘44-’45 was one of the most severe we remembered. 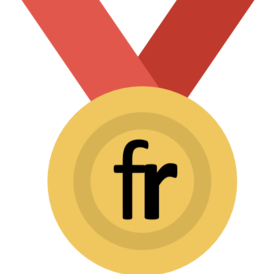 The “hongertochten” hunger trips from the large cities started. Long rows of people came across the narrow roads into the polders of Noord-Holland. Also into Purmerend they came, sometimes in small groups and sometimes alone. Most often they had something to take food back in, sometimes large carryalls, sometimes home made carts or old prams, or sometimes bicycles with wood covered tires. They would ask for food at farms or at houses, they’d ask for 1 potatoe or 1 slice of bread or something like that. They also came to my in laws’ house. One woman I clearly remember. She looked poor, neglected and very skinny but in her speech she was very cultured and polite. We had no idea what type of person she was of course. My mother-in- law gave her a meal. After the war the woman returned. We didn’t recognize her initially. She was beautifully coiffed and dressed. She came to thank my mother in law for her kindness and gave her a jar of salve to be used on infected skin. She turned out to be a professor in medical science and had been very thankful for the food. The salve worked wonders and we used it for many years after the war. In the mean time I still went to Amsterdam every Friday to pay the rent to Buurvrouw Bieshaar. I cycled from Purmerend via Zaandam to Amsterdam. It was a little further but there was fewer chance of being checked by the Germans or their Dutch collaborators. 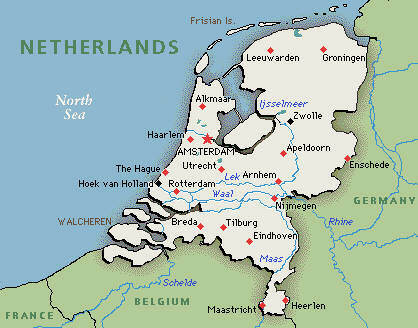 I used to enter Amsterdam through the Spaarndammer area and riding through the city it got worse every week. I would see people falling to the ground from hunger and exhaustion and some were lying dead in the street. The thing that moved me most was that everyone just kept walking as if this was the most ordinary thing in the world. Once, when I went to pay the rent I had brought a reasonable amount of food; some vegetables, apples, potatoes all I could lay my hands on in our area. Even in the Beemster there was less food now. Ab’s mother had made cookies, one had to become very creative with the ingredients available but they were still sort of tasty and they were also in my saddle bags. When I got to the ferry there were a few people gathered who had been on a hunger trip to the polder of Noord-Holland. There was only one ferry and I had to wait. While I looked around me I saw a woman listlessly waiting and I thought I could see death in her eyes. She was so very skinny, with dark circles around her eyes which were so intensely sad. I thought I’d give her some of the cookies. As she thanked me and ate them out of nowhere appeared this whole group of people from Amsterdam, all with stretched out hands, all telling me “ Oh please give us some food too, we’ve not had anything to eat in so long! Please can we have something?” All those hands, hungering hands! They thronged around me. It is an image I’ve never been able to forget! I had no food left to bring to Buurvrouw Bieshaar—I can’t remember how I explained it to her or how she reacted. After that experience I went a number of other times to pay the rent and in 1945 thank goodness we were liberated! The happiness of it all in hard to explain. Food transports started up again. That first white bread that we got to eat, dropped by airplanes from Sweden.... I’ll never forget it. It was like cake to us. Everything was still rationed but there were things for sale again. We immediately returned to Amsterdam to find that the neighbors who’d lived on the third and fourth floor were no longer there. Buurvrouw Bieshaar was still there. I kept in touch with her until she died. In those difficult years she had been like a mother to me. There were enormous liberation parties in the city, there was singing and dancing in the streets. There was a sea of flags and I remember the Saturday that the liberators, Canadians, drove through the street with heavy tanks and other military vehicles. Our old buildings were shaking from their weight. General Montgomery wa also part of the parade, we saw him in his open Jeep go by our house. The weather was beautiful, we had pushed the windows up and hung out of them waving to our liberators. The happiness of it all is still so vivid! Those war years 40-45 made an indelible impression on my thoughts and actions for the rest of my life. After all, at the end of the war we were both in our late twenties and our whole lives were still ahead of us. 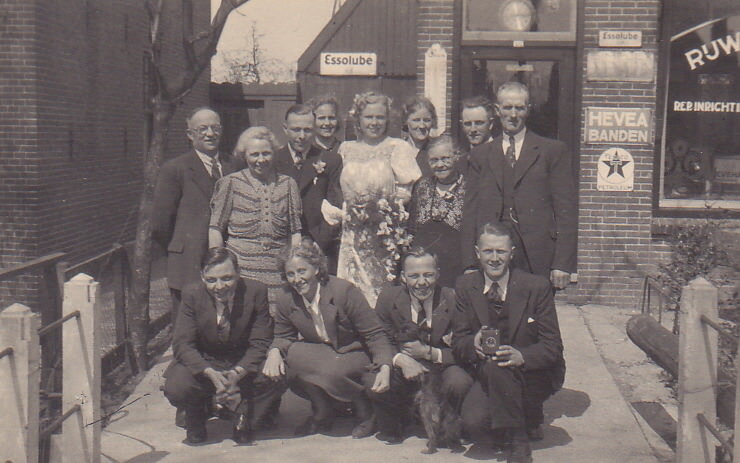 Geertruida (Truus) Baas' story was told to her youngest son, Robert. It was translated from the Dutch to English by her niece, Lynn de Vree.